My Great Aunt (96) is reasonably cognizant but losing her hearing. She went to an audiologist but just doesn’t want to wear her hearing aids. Any tips for communicating with her other than yelling? 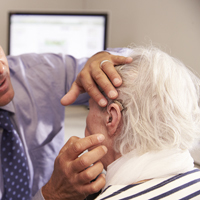 People with hearing problems often learn to lip read without recognizing that they’ve acquired that skill. Use good lighting, face your aunt, and speak clearly at a moderate speed. Keep your mouth visible, not hidden by your hand or a cup. Use facial expressions or gestures to give clues to your meaning. Call Deaf & Hard of Hearing Services of the Treasure Coast (Voice 772-334-2233; Fax/TDD 772-334-2299) to apply for a free amplified phone. For more tips contact the National Institute of Deafness and other Communication Disorders (NIDCD) at www.nidcd.nih.gov.